FIFA 19 Kick-Off mode will be getting new inventive features. FIFA series is one of the longest franchises in the gaming world. With the passage of time, EA has added the cutting-edge improvements to the series. However, one of the most neglected features of the game is FIFA 19 Kick-Off mode. But EA has made its determination to modernize this mode as well. This time around this mode will have some major changes which will totally redesign it. These new inventive features will be comparable to the major modes like FIFA Ultimate Team and Manager Mode. 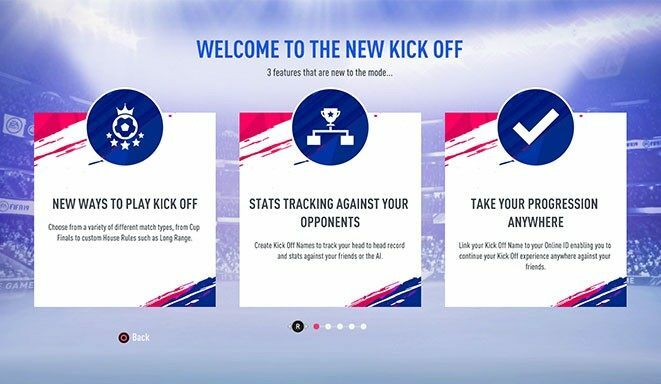 Moreover, with these new features coming, FIFA 19 Kick-Off mode will finally be one of its best features. This year EA is bringing drastic changes to FIFA series latest installment. Another noteworthy mode in the game is FIFA House Rules. This mode will feature the new ‘First To’ settings in which the team scoring the first goal will win. Furthermore, the game features another noticeable setting like a survival mode. In this setting, the teams will start losing a player with each goal. Another setting will allow only the aerial goals in the match. The teams can score these goals through headers or volleys. The new FIFA 19 Kick-Off mode will also show matches history’s catalog in details. Of course, to make it more efficient the logins will keep the details of the players against each other. These details will also include the exact positions on the field where your team has scored against a certain opponent. EA will also include new settings for the exhibition mode n FIFA 19. These settings will remove the boring elements from the friendly matches. For instance, players can choose the friendly match to be the final of the Champions league or just a simple plan league match. The AI of FIFA 19 will keep the balance of the matches which means players can start a match with a set score. The AI will also monitor and ensure the fairness of the game making it more difficult to win against smaller teams. We can say that EA has put a lot of effort into FIFA 19 Kick-Off mode and other settings in the game. Now we are waiting for the game to release on September 28.